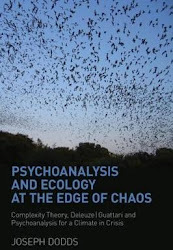 Ecopsychoanalysis is a new interdisciplinary approach to thinking about the relationship between psychoanalysis, ecology, 'the natural' and the problem of climate change. It draws on a range of fields including, psychoanalysis, psychology, ecology, philosophy, science, complexity theory, aesthetics, and the humanities. It attempts to play with what each approach has to offer in the sense of a heterogeneous assemblage of ideas and processes, mirroring the interlocking complexity, chaos and turbulence of nature itself. Ecopsychoanalysis, fully supporting the new Climate Psychology Alliance, thus constitutes a timely attempt to contribute towards a critical dialogue between psychoanalysis and ecology, and helps us begin to re-imagine therapeutic practice where we can start to create spaces for thought that links to the Earth. By conjoining geophilosophy with complexity theory, ecopsychoanalysis helps to develop the potentials in both, providing the philosophy we need to help us think through the implications of this new form of nomadic nonlinear science, and the science to develop the intuitive leaps generated by philosophy, providing a new unheimlich home in which psychoanalysis can think through the ecology of phantasy. Ecopsychoanalysis views earth and mind as intertwined, folding back on one another in a multiplicity of assemblages, becomings and lines of flight. Nature becomes something both reassuring and terrifying, that ambivalent uncanny terrain that psychoanalysis, despite all its faults, has made its own. Thought and earth move together, become destabilized together, flow and erupt, thought becomes turbulent multiplicity. Overcome binaries between mind/nature, mind/body and human/animal, specifically with relation to climate change and the ecological crisis. Connect a range of psychoanalytic traditions to a new focus on the other than human world with far reaching implications for psychoanalysis; clinical, theoretical and applied. Draw on the philosophy of Deleuze and Guattari including Guattari’s ‘three ecologies’ of mind, nature, and society. Engage a critical dialogue between ecopsychoanalysis and related fields such as ecology, ecopsychology, psychoanalysis, schizoanalysis, and complex systems theory, and philosophy. Identify both the dangers and the opportunities of the current ecological crisis, including the opportunity for a re-visioning of ourselves in our complex dwelling within the three ecologies. The next ten years are central to moving forward towards new forms of interdisciplinary writing and research, and ultimately new forms of relatedness to the earth. The complex interdependent web that climate change sets up between the three ecologies of mind, nature and society, demands that we start be able to think, feel and act in more ecologically complex forms. Ecopsychoanalysis calls on us to bear the ecological thought and to re-vision the world and ourselves in nonlinear ways, mirroring the strange ecology that swirls around us and threatens to destroy us, but which, in all its chaotic beauty and nonlinear terror, may perhaps show us the way out. Ecopsychoanalysis should not be seen as a theory, more a concept or toolbox which falls into streams of thought, folding and unfolding on a plane of immanent becomings, a set of circumstances at a volatile juncture, a point of application of force moving through space, an energetic location which fuels the act of understanding helping us to take lines of flight. Dreaming at the precipice, we have the opportunity to develop a more open vision of ourselves, as subjects, as societies, and as a species among the interconnected life systems of the earth.